The Serpent is symbol of rebirth, shedding its old skin and reemerging in the Spring from the Winter's hibernation seeming to be immortal. The Great Serpent Ouroboros is the Earth Dragon living forever in the underworld. 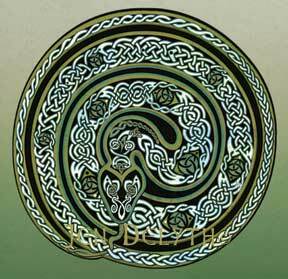 Many Celtic healers appear with snakes, often associated with water, rivers and curative springs (entrances to the underworld). Serpents are frequently found on torcs, the sacred neck ornament of the Celtic kings and divinities, embodying the power of the earth, and eternal life. Every ancient mythology has some form of World Serpent. To the Celts, a symbol of her cosmic world-creating seed was the round, spiny sea-urchin. The Serpent was one of the most ancient symbols of female power, since both seemed to embody the power of life. The coiled serpent with its tail in its mouth is a circle of infinity and eternity, representing cyclical evolution and reincarnation.